Stamp the image with Memento Tuxedo Black on Neenah Solar White Smooth cardstock and colour the image with Copic markers. For her hair I used E11, 13 and 15. Skin: E0000, 000, 01 and 02. Face detail: BG10, 11, YR00 and 02. Eyes: BG13 and 15. Flowers and Leaves: E01, 02, YR00, 02, BG13, 15 and 49. Add highlights to her eyes with a white gel pen. 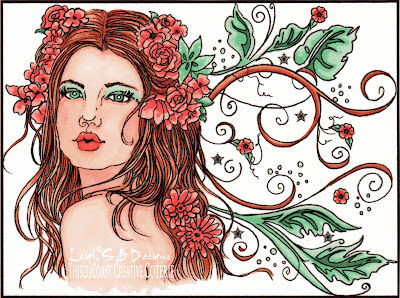 The decorative cardstock I used is from the CardMaker's kit of the month club. I like getting the kits so I have all these cool cardstocks and embellishments that coordinate nicely together. Make a folded card from teal cardstock with white polka dots that has glitter detail and cut a mat slightly smaller from black cardstock. Then a mat from the floral peachy/orange cardstock that also has glitter details. Distress the peach and the black mats with Tim's Distress Tool. Layer and adhere everything with double sided tape. Add the gorgeous silk flowers with matching glittery brads (also from the same CardMaker kit and the punch out colour coordinated leaves and finish off with the self-adhesive black pearl embellishments. I would have loved to have gone more dimensional with my embellishments but this card has to make it to the UK safe and sound even with extra padding and hand cancelling surcharges so I try not to go too crazy! Here's a peek at the inside of the card too. 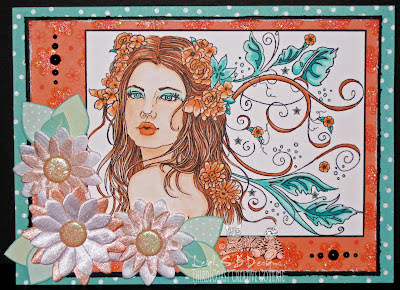 I decided to pick up on the swirls and daisy design and used a little cling stamp set I also got from CardMaker. The sentiment I got in South Africa and there's no company info on the wood block so I haven't a clue who makes that. The sentiment is stamped with Brilliance Rocket Red Gold, the Daisies with the pinkis-orange colour from the Brilliance Aurora tri-pad and the flourishes with mix of the Brilliance Peacock tri-pad. All the ink pads have that wonderful pearlescent shimmer to them. 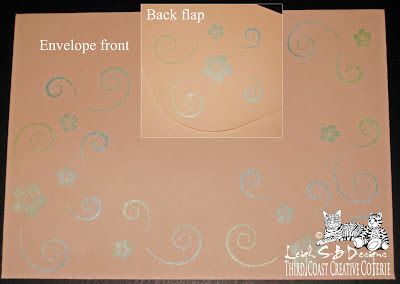 Of course I had to stamp a matching design on the peach envelope too! 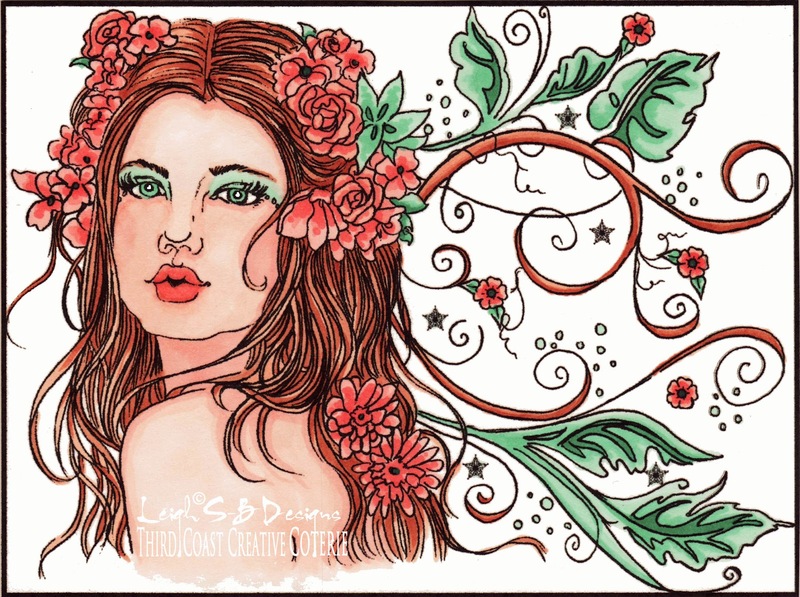 Friday June 29: Woohoo, this card was featured at Inspire Me Fridays! Stunning Leigh!! your coloring is amazing!! Thank you for sharing @ Joyful Stamper's Inspire Me Fridays! 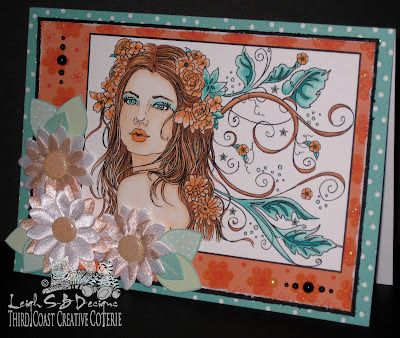 It's a beautiful image and card.Thanks for sharing it with us at ATCs and Cards with Attitude. Wow! this is fab Leigh! what a sweet image and you've coloured her so beautifully! 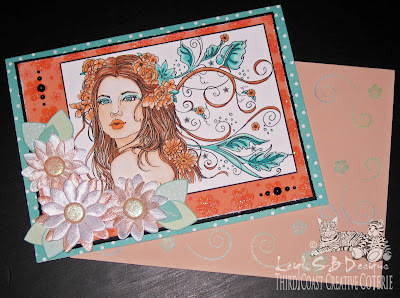 The papers and embellishments are gorgeous - it's a really stunning card! Thanks for joining us at MAWTT for our Birthday theme and Good Luck in the Challenge! Really pretty color scheme! Paula will love it!! Very pretty! We are glad to have you join us this week at Dilly Beans challenge! Your sister is sure to love it! Gorgeous image (looks so real) and great way to use dotted paper. This is just beautiful. You should be proud of the coloring. Wow! Great job. Thanks for shareing with us at Dilly Beans this week. Beautiful card, she'll love it! !